Just ordered 2500 glossy color business cards to send everyone. I will let you all know when they are in. Should be next week. I had them made with the new graphics and they are made on thick glossy stock. Soon as they come in I'll give you all a way to place an order for them for free. That way I can get your address to mail them to. I will toss in a windshield sticker also. Here is the front and back. The link to get cards to handout.Slingshotinfo.com cards to hand out. Just add to cart and choose free shipping and complete the checkout. In much need. Been trying to get some hard headed friends to join and I seem to be meeting quite a few new owners in my area as of late. Would sure help to just hand them a card. Cool Deal, ran out also. there is a lot more slings showing up down here. trying to get the word out to get on this form. best family ever. Awesome I was just asking someone about cards, I did not know we even had any. I hand cards our for T&T Power Sports all the time. it is the Polaris dealer I bought my SS from. I'd like a few cards. I passed two new slings today. I told them about the forum but who knows if they'll remember. I will put them as an item in the store for free. That way I can capture the shipping address. . Give me a little while and I'll try to add them tonight. I know you are bring some! I will bring plenty with me. Just curious. Where is @Bubblehead? I havent seen him lately. He called a couple of weeks ago and everything was good. 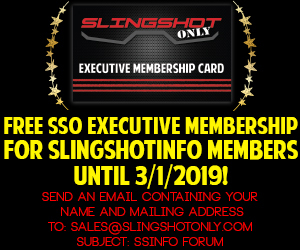 Slingshotinfo.com cards to hand out. The link to get cards to handout... Just pick free shipping and then complete the checkout process. @rabtech free shipping is not an option. Or you added something else with them. Check and see and let me know. I have it set to allow free shipping when you only have 1 business cards pack in your cart.